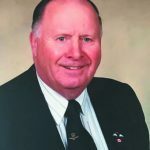 Major Robert “Bob” James Connell of Mississauga passed away on Friday, March 8, 2019, at the age of 83. He leaves behind his beloved wife Bethenia Connell (née Davie) and step-daughter Sarah Duffey. Remembered by all of his cousins, friends and neighbours. Predeceased by his parents James and Martha Connell and brothers Jack (Lee) Connell and William (Nancy) Connell. A celebration of Bob’s life will take place in the spring. Memorial donations to the Heart & Stroke Foundation would be appreciated as expressions of sympathy. Portrait and memorial available online at www.daveylinklaterfuneralhome.com.